I’ve been drafting this post almost since we started the blog, waiting for conclusions to form. In the way that people like me do I’ve been trying out arguments in my head and then responding to them, hoping to settle on an answer. I’m not there yet. So this is part one of a three part meandering blog post. Please chime in and help! 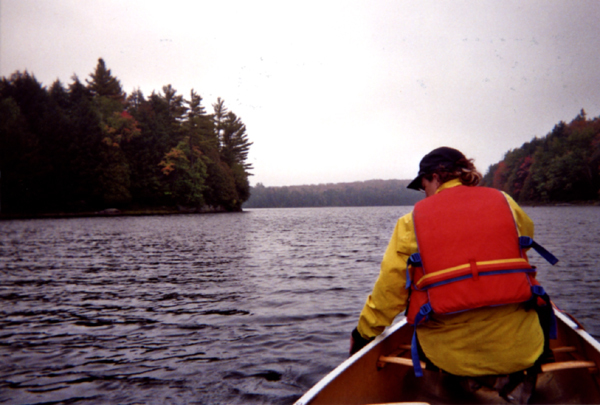 So I began this series of thoughts with my very first trip to Algonquin, more than 10 years ago now. On our way out Laura and I remarked on how few women there were out there, especially once you got past the first couple of portages. It was October (not warm) and by the time we got to “our lake” the only other people we saw were young men, clad in Gortex, draped in bear bells, running the portages. They seemed like another kind of being entirely! Laura and I laughed about it and then we talked about carrying canoes and strength and how lucky we felt being able to do this trip. The back country of Algonquin is so beautiful, so rugged, and I wanted to share. But most people can’t do trips of this sort. You need skills (thanks Laura, and Susan, and Mallory, and Sarah for teaching me) but you also need a certain level of physical ability. In addition, you need to be comfortable sleeping in a tent, on the ground, and in some cases bad weather. It felt like a reward for our fitness, something our physical fitness allowed us to do. But there’s also a lot of luck involved. Laura learned canoe tripping from her father but on his last trip into the park, it was Laura’s turn to lead. Her dad has MS and I was moved by Laura’s story of paying her father back for the gift he’d given her by taking him in the canoe and doing all the work. It’s a sign of something being special that those of who love a place and an activity really want to share it. Susan took me on a canoe trip the very first time we spent any amount of time together. Susan’s blogged here too about her trip with her teenagers and her mum. Recently Sarah and I took Jeff on his first canoe camping trip. So we want to spread the word and share this beauty. It calls to you that way. But you can only share it with some people. So part of me wants the back country to be more accessible. My last trip had steep portages and ankle deep mud. You needed a certain kind of strength and balance to pull it off. But if it were easier, more accessible. it wouldn’t be the same. We wouldn’t be there alone, on our lake. A friend’s wife said she’d love to come with, if there were a four star hotel in the middle of the lake, that you could helicopter in to. We laughed. But she was serious. Why isn’t that a thing, she asked. I wasn’t sympathetic. So on the one hand, why is this a treat reserved for the fit and the non-disabled and the rugged? Should there be some easy ways in and out for those who can’t canoe and portage in? Why couldn’t it be something we all get to experience? On the other hand, there’s the quiet and the solitude, and the care and concern for the environment that’s part of back country canoe camping. How to strike a balance between those values and the value of accessibility? Thanks for this, Sam — I have lots of the same thoughts. Part of me has this thing where the solitude and peace is “earned” by the physical effort of getting there — and that it’s only possible because it IS so much effort to get there. (I.e., a luxury hotel in the middle of the wilderness makes it NOT wilderness by definition! I’ve stayed at a semi-fancy lodge in algonquin park and it’s really not remotely the same thing — the stars are the same when you lie on the dock, but you get yourself in a swivet because it costs so much money and they didn’t bring you a spoon with your soup until the soup was cold. It’s not the “this mess of rice and beans eaten with this one spoon is DELICIOUS” minimalist simplicity and joy of canoe-tripping. At the same time, of course, the question of accessibility is huge — there is a difference between “I can do this but choose not to” and “this is actually physically impossible for me.” It’s a paradox, and it does seem deeply wrong that this is just not possible for people who long for it. I had the experience once of trekking gorillas in Uganda (very physically demanding) where a woman who was ill with cancer came along carried in a litter by two guides. That was an interesting (and privileged!) “hack” to gaining access to that experience. I HAVE stayed in more remote places that come close to the wilderness experience while being accessible — fishing camps you can get to by road, etc. The simplicity of presence on the side of a northern river — no fancy hotels — but much less physical effort. I don’t know if making that kind of space easier to navigate is part of the solution? I’m not sure I think accessibility is a given. We are talking about remote, natural landscape. Not a man made hotel. If people choose to go into these areas they should be equity and able to meet the demands. I always think of the hikers who climb Mount Everest, but aren’t really prepared. They put many others in danger…if you can’t carry your canoe over a fallen tree, you should not be canoeing in the wilderness. There are vast areas of Canada that are only accessible by foot, maybe quad, boat. I live in the middle of such an area. I don’t know much about being in the woods, and so I stay out of them. But it’s only a quick drive to a completely dark area to get a better view of the northern lights, etc. I don’t need to make it into an adventure. I can get all I need from an easily accessible point. Building a beautiful and accessible 5 star hotel in a remote area is always an option. But people would go there for something different. A safe, secure and comfortable brush with nature. It’s natures natural beauty. And it is huge. I like your thoughts, Anne — Canada IS so vast and some of that vastness is by definition almost inaccessible. Your point about being prepared to deal with Things that Go Wrong is important, I think — as well as how possible it is in most of Canada to get completely out of an urban area quickly. (I loved that in Yellowknife I was in the wilderness in a 10 minute drive out of town). I have a different perspective. I live in a large urban area where it is literally impossible to get away from people— even “wilderness” areas within a couple hours of town are swarmed. It’s really hard to find solitude, and one of the things I enjoy about backpacking is just being alone. There used to be some unspoiled places where you could go into the backcountry, but even those are busy now (with the attendant noise and trash). Not everyone wants to hoist 40lb on their back and walk for 8 hours to find solitude. Which is fine by me! We certainly live in a huge country with wilderness. People really truly have got to remember that camping and going into rugged wilderness is a….cultural European/North American experience. It really is..some of us have immigrant family members who come from countries (Asia) where sleeping on ground in woods is viewed as being “poor” –especially from those who grew up in poor areas in Asia. They had no choice. And honest, rightly so if they have memory as children living without electricity, without comforts of plumbing….like my parents in China even in rural areas in 1920’s to 1930’s…..
as valid as us toughies, who want to hike for several hrs., etc. One day we will all be unable to scale steep mountain sides, etc. My first thought is, there are ways that are accessible to some degree. There is car camping in Algonquin. There are secluded places you can drive to. But I’m aware that I’m saying “there’s things of the same nature or quality” but they are not the same. I’m also feeling like there is something about how we value these experiences as somehow “better” or more valuable than another experience. There lots of places no one can go. There are some places no one should go because frankly going into the wilderness doesn’t have much to do with preserving it. We are invading it for our pleasure and hoping it doesn’t kill us. We are much more likely to kill it. So as much as I love back country camping, and I do it, I don’t want to idealize it and then make it into some wholely good thing that some people can have. It’s a complicated thing, like everything else. Maybe we who do it shouldn’t deprecate other ways of being in natural environments explicitly and implicitly. I’m totally guilty of this by the way. I’m rethinking that now. Thanks! I haven’t camped in the last 15 yrs. We did do it combined with cycling on trips, for about 5 years. He for more years than I before he met me and after I stopped. It was simply for me, not as enjoyable since I felt “pressured” for lack of enough vacation time with full time job and I didn’t want my vacation dominated by setting up camp and then de-camping, before cycling another 50-100 km.. on that day. We may be falling into the trap that wilderness enjoyment is “better” if it’s just pristine/beautiful/more remote or yes, just effort of hiking, etc. to get there. We must always remember our benchmark of physical fitness and doing well ….can be equal to a woman who has survived other life difficulties but she hasn’t gone jogging or whatever fitness activities are available. I appreciate my mother’s “fitness” to bear and raise 6 children! And she has never participated in any exercise beyond walking to a shopping destination in her younger decades.